Texas Beyond History (TBH) is a public education service of the Texas Archeological Research Laboratory at the University of Texas at Austin, and in partnership with the Department of Anthropology at Texas State University and 15 other organizations. Begun in 2001, its purpose is to interpret and share the results of archeological and historical research on the cultural heritage of Texas with the citizens of Texas and the world. In this virtual museum you will find information on and images of many different aspects of the cultural legacy of Texas, a legacy spanning at least 13,500 years. Yes, people have been living within the borders of the modern political state of Texas for at least 13,500 years. In more concrete terms, that is over 540 human generations! For most of that immense time span, there is no recorded history, no books, and no eyewitness accounts. Instead all we have to tell the stories of much of the cultural heritage of Texas are mute stones, ancient campfires, broken bones, and delicate traces of once-flourishing societies. This is the "material evidence" upon which archeologists base most of our interpretations. The arrival of the first Spanish explorers in the region in 1528 marks an end to "prehistory" and ushered in the historic era in Texas and the creation of the written documents and drawings upon which historians depend. Our collective cultural heritage is complex and fascinating, if sometimes painful to recount. The sixteenth-century arrival of the Spanish, for instance, also marks the beginning of over 300 years of often-brutal cultural conflict between Texas' native peoplesIndians or Native Americansand the mainly European-derived immigrants who made the land their own. In a few short centuries the native population of Texas was decimated. Texas Beyond History covers not only the prehistory and history of Texas' true native peoples, but also much of the early history of the Spanish, French, Mexican, and Anglo explorers, missionaries, soldiers, miners, traders, and settlers who lived and often died in Texas. And later history, toothat of German farmers, Black freedmen, and Mexican-American laborers among many others. What sets Texas Beyond History apart is that by focusing on the broad subject of Texas' cultural heritage, we overcome the traditional boundaries between the disciplines of archeology and history as well as the bureaucratic and political fences between institutions of higher education, state and federal agencies, museums, and private organizations. By working in partnership and collaboration with dozens and dozens of individuals, institutions, and organizations, our aim is to help tell the stories of the peoples who have settled the land we call Texas. To do that we reply on diverse experts as well as the documents and images that help put the stories of the past into meaningful context. The other sections under About TBH and the Credits & Sources sections throughout the website acknowledge the many individuals and organizations that make this website possible. The Texas Archeological Research Laboratory (TARL) of the University of Texas at Austin is a nationally recognized archeological research facility and the largest archeological repository in the state. We are an organized research unit under the College of Liberal Arts at UT-Austin. Our mission is to collect, preserve, and curate archeological specimens and records, train students, conduct archeological research, and disseminate information about Texas' archeological legacy. The Texas Archeological Research Laboratory was created in 1961 to consolidate the University's archeological collections and provide stronger institutional support for continued research. As a repository, TARL safeguards the collections and records from literally thousands of archeological investigations conducted by UT-Austin and many other universities, state and federal agencies, and private firms across the state. Because we are not set up as a physical museum, Texas Beyond History serves as TARL's virtual museum and provides ready access to information and images about Texas archeology. TARL staff members support the website in many ways from administration to collections and records. You can learn more about the Texas Archeological Research Laboratory by checking out our organizational website. Texas Beyond History is led and managed by Co-Editors Steve Black and Susan Dial. Both are major contributors to the writing and photography used on the website, and they also plan and develop exhibits from outside contributors. 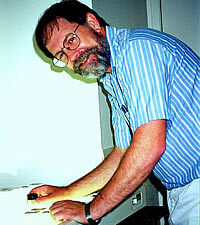 Steve Black is the Director and Co-Editor of Texas Beyond History. He holds a Ph.D. from Harvard and has worked for more than four decades as a professional archeologist in Texas, Mesoamerica, and the Southwest. He grew up in Austin (BA, UT-Austin) and lived and worked in San Antonio and parts south for many years while working at the Center for Archaeological Research at UT San Antonio (MA, UTSA). He is also a writer and author of many technical studies as well as popular articles on several subjects including archeology. He is the author (with Kevin Jolly) of Archaeology By Design (Altamira Press, 2003), a practical guide to the process of planning and carrying out successful archeological research projects. In 2008 Black joined the faculty at Texas State University where currently he is an associate professor of anthropology, carries out research in the Lower Pecos Canyonlands of southwest Texas, and continues his work on TBH. Susan Dial is Co-Editor of Texas Beyond History. She holds an MA in anthropology from UT-Austin and BA in journalism and has worked as a professional archeologist, newspaper reporter and editor. A fifth generation Texan who grew up in San Antonio, Dial has a keen interest in telling many of the little-known stories about Texas' history and prehistory. Her role overlaps with that of Steve Black's in conceptualizing, writing, and developing web exhibits. Dial also serves as Education Editor, creating many of the Kids Only sections and supervising development of curricula with the TBH Educational Consultants. 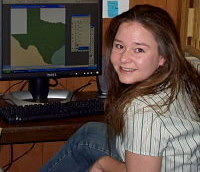 Heather Smith is Associate Editor of Texas Beyond History. Heather completed her M.A. in anthropology in 2010 and Ph.D. from Texas A&M University in 2015. She is currently an assistant professor of anthropology at Eastern New Mexico State University where she continues her research on Clovis and other fluted points, Paleoindian behavior and technological adaptation. She also holds a B.A. in Photocommunications from St. Edwards University, where she received web and graphical training. For TBH, Heather has served as TBH Web Developer since 2005, focusing on exhibit development, artistic design, and web programming. She also has created several K-12 interactives and contributes to research and writing. Since the website's inception, the TBH staff has been assisted by undergraduate and graduate students mainly from UT-Austin who have helped build Texas Beyond History while learning about the state's cultural history and developing useful skills. Several of the students who have begun as interns have continued as full-fledged editorial assistants, working part-time on the project. The editorial assistants have scanned and manipulated thousands of images, maps, and documents, carried out background research, created graphics, and helped with writing and editing. Heather Smith is one of the key former students who followed this route. 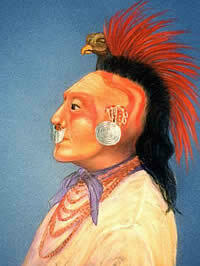 A Caddo man in bird headdress as visualized by artist and archeologist Reeda Peel based on a description of Caddo men in state dress for a meeting with General Manuel Mier y Terán in 1828. 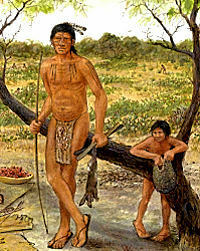 A Coahuiltecan Indian holds a rabbit felled by the wooden "rabbit stick" in his hand, while his son holds a net carrying bag. 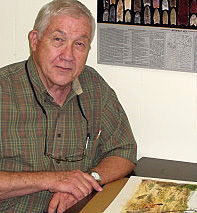 Artist Frank Weir draws on more than 30 years experience as a professional archeologist in Texas. TARL collections. Important organic artifacts (fiber, wood, bone, and shell), stone tools, pottery, and metal artifacts, are curated in a secure, temperature -controlled facility at TARL. 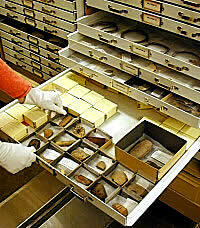 The artifacts are stored by site in state-of-the-art museum cabinets. We are fortunate to have had talented educators who are passionate about Texas history and archeology serve as TBH Education Advisors, including Mary Black and Laine Leibick. 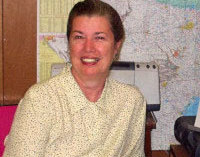 Carol Schlenk is Education Editor of Texas Beyond History and brings to the website her considerable experience as a classroom teacher, curriculum specialist, and teacher trainer as well as her work as education coordinator for the Texas Council for the Humanities. In addition to developing first-rate K-12 curricula for teachers, Carol has created interactive games and learning activities for students and has worked as a curriculum specialist with the Texas Education Agency. 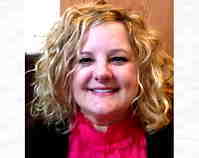 Carol has been instrumental in developing and promoting TBH content for K-12 students and teachers since 2005.
teachers throughout the district. Amy taught 6th , 7th and 8th grades for more than a decade and teaching remains her first love. In 2000, Amy served on the Education Ad Hoc Committee of the Bob Bullock Texas State History Museum. She is currently a member of the executive board of the Texas Council for Social Studies. Artist Frank Weir, a retired archeologist with more than 30 years experience, creates many of the colorful interpretive scenes seen on the pages of TBH. Frank's artistic talents, coupled with his knowledge of native peoples and the archeological traces they left behind, are an unusual blend which translate into sensitive and compelling depictions of the past. Other evocative artwork has been contributed by the late Charles Shaw, by Nola Davis, formerly of Texas Parks and Wildlife Department, as well as by artist and archeologist Reeda Peel, formerly of Sul Ross University. About half of the website's content is donated by individuals and organizations around the state and beyondsee Content Contributors. Three individuals who have voluntarily worked with TBH since its founding are Contributing Editor Steve Dial, Website Consultant Meg Kemp, and Reviewer and Contributor Ken Brown. Their expertise and efforts helped shape the success of TBH, and they continue to contribute their talents when called upon. An avocational historian, Steve planned and wrote most of the special exhibits on Texas' Frontier Forts and has consulted on numerous historic site exhibits. 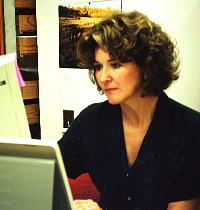 Meg Kemp was the pioneer Web Developer for TBH, and is responsible for the innovative design, structure, and many of the most popular exhibits and features of the website. Ken Brown is a TARL Research Fellow and specialist in paleoenvironmental analysis and the study of wooden artifacts. In addition to his expert review of numerous exhibits, he wrote the McFaddin Beach exhibit for TBH. Major help in web development has also come from UT staff and students working through the College of Liberal Arts Instructional Technology Services (LAITS). Assistant Dean Joe Tenbarge is director. Key LAITS staff who have helped develop and revamp Texas Beyond History include Suloni Robertson, Stacy Vlasits, and Ruben Garza. The 2015-2018 LAITS Student Technology Assistants who helped with TBH interactive and web page style updates include: Erica Ndubueze (TBH home page design), Nick Lavigne (LAITS Student Technology Lead), Rodrigo Villarreal (2nd Lead),Tate Gibson, Aidan Kessler, Chloe Kim, Bridget Kessler, Anna Xu, Bryan Xaio, Lauren Shafford, Qi Wei Li, Anne Yue, Audric Ganser, Ben Liu, Michael Lam, Bethany Wong, Rebecca Chen, Jun Tan, and Teresa Cagle. At Texas Beyond History we value what you have to say about our effortspraise and criticism alike. And if you notice a mistake, large or small, let us know, and we'll do our best to fix it. Or perhaps you have a suggestion for how we might improve the website. While we do not have a general links page, we do provide links on the Credits & Sources pages throughout the website to non-commercial websites that have useful content directly related to any of the exhibits featured on TBH. If you are aware of such a website, please let us know.